Warren Brown (Oliver, BC – 2002 Kawasaki) took a place he’s fairly used to in the winners’ circle by beating out Dan Ofukany (West Kelowna, BC – 1999 Arctic Cat) in the final round. Lorne Pearson (Grand Forks, BC – 1986 Chevy S-10) zipped to victory over Brad Baxendale (Summerland, BC – 1969 Beaumont). 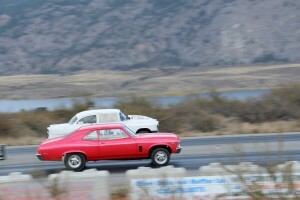 Shana Cachola (Oliver, BC – 1972 Chevy Nova) beat Bruce Mackereth (Summerland, BC – 1955 Chevy 2 door) to the finish line. 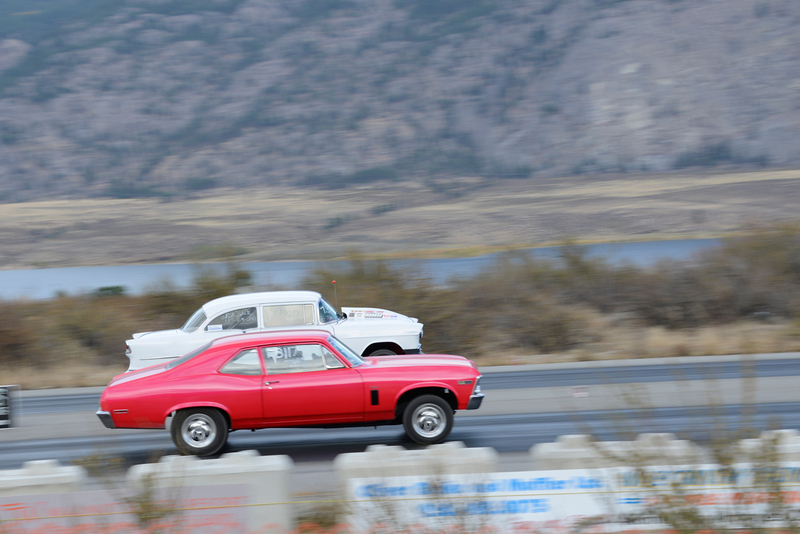 Jim Behnke (Mission, BC – 1971 Plymouth Scamp) hauls the trophy a long way home by triumphing over Blair Ogilvy (Osoyoos, BC – 1981 Chevy Pick-up). Two perfect lights this race! Michael Stewart (Cloverdale BC) in his 1967 Chevy II and Brad Quwek (Bruderheim, AB) in his 1973 Pontiac Astra both had a perfect .500 light! This honour was bestowed to Brad Heppner and Julia Hudson (BJ Racing) from Sicamouse, BC. Brad and Julia haul their rail car a long way every race, just for a little fun. A new trophy, custom made by Oliver’s Cliff Meeds, is the “hard luck” trophy. This was given to the poor racer who broke his car more than anyone else this year. Sadly Awarded to: Dean Book of Penticton, BC. The best part about Dean is the well-known fact that he’s going to be re-figuring and rebuilding his truck for more racing next year. Thanks for being a good sport Dean.